The 2014 Hero Dog Awards seek to find and recognize dogs who help people in many important ways. Dogs are nominated in one of eight categories: Service Dogs, Emerging Hero Dogs, Law Enforcement, Arson Dogs, Therapy Dogs, Military Dogs, Search and Rescue Dogs, Guide/Hearing Dogs. Interacting with an animal can be very theraputic for humans. While other animals, such as horses and cats can be great therapy animals, dogs really excel in helping humans who are going through a difficult or troubling time. A certified Therapy Dog can make a significant contribution to many treatment programs. Dogs began helping our military forces as early as World War I, but it wasn't until World War II that the Army established its first K-9 Corps. They serve as scouts, detection specialists for explosives, and assist on guard duty to protect US service men and women around the world. Nowadays, dogs have their own military service records and can be awarded commendations for outstanding service. It is not possible to count the number of lives military dogs have saved, sometimes at the extreme cost of their own. The Military Dog category seeks to recognize the dedication and valor of these extraordinary animals. For the past couple of weeks I have highlighted some of the eight finalists for the Hero Dog Award, sponsored by the American Humane Association. “JJ Krawczyk” was nominated in the Service Dog Category, “Xena the Warrior Puppy” represents the Emerging Hero Dog category, “Kai” is an Arson Dog, and “K9 Kota” represents Law Enforcement Dogs. A Pit Bull-Shepherd mix named Susie is nominated in the Therapy Dog category. In 2009, she was the victim of extreme abuse. Only eight weeks old, she was beaten, set on fire and left to die. She was found wandering two weeks later with a broken jaw and severe burns over sixty percent of her body and taken to a humane society where she ended up being adopted and loved back to health. She has no ears – they were burned off – but she does have a law named for her: “Susie’s Law”, which increased the penalty for malicious abuse of an animal to a felony. When the governor of North Carolina signed the law into effect, Susie added her paw print next to his signature. 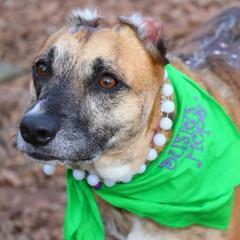 Today, Susie is a good-natured, loving therapy dog who teaches children that they can overcome adversity. Her FaceBook page is “Susie’s Hope”. Her charity partner is Paws & Effect, which raises and trains service dogs for children and veterans. The Military Dog category is represented by an eight-year-old Lab named Chaney, a canine Marine who served in both Iraq and Afghanistan. He used that sensitive and highly trained nose to detect explosive devices, saving the lives of countless American Soldiers. He retired last year and was adopted by one of his handlers. 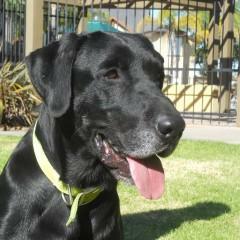 Together they volunteer for Retrieving Freedom, which trains service dogs for disabled veterans and autistic children. Chaney’s charity partner is America’s VetDogs, which provides guide dogs for blind veterans and assistance dogs for vets with other disabilities including PTSD. 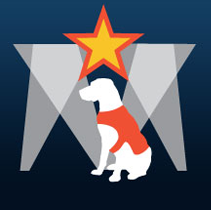 Learn more about the Hero Dog Awards by visiting the website at HeroDogAwards.org. Cast your vote for the finalist you think should be America’s Hero Dog. In my opinion it seems like an impossible choice because they are all heroes, when we’re speaking of pets.